This Vintage Toys Clear Stamp Set is 4x6". There are 10 stamps in this set. The jacks and ball are separate stamps. The plane is about 5 1/2 " long. The Soldier is 3" tall. 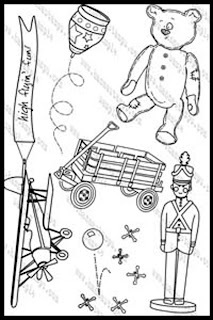 I used the toy Soldier on my card shown below. This Hanna Stamp set sells for $15.50 plus shipping. Please e-mail if you would like to purchase this set. I accept Visa, Master Card and PayPal.